Bay Area dance makers Lauren Simpson and Jenny Stulberg’s Still Life Dances were based on 19th century still life paintings from the de Young Museum’s permanent collection. Researched and created between 2013 and 2018, the series included 8 pieces that were shown in a variety of performance venues throughout the Bay. In her new work Dance Exhibit, Simpson enters in dialogue with the sculptural work of visual artists Dana Hemenway and Brion Nuda Rosch. Both artists have studios at Minnesota Street Project, which provides economically sustainable spaces for art galleries, artists and related non-profit organizations in three remodeled warehouses of San Francisco’s Dogpatch neighborhood. Simpson, currently an ODC Theater resident artist, is the first choreographer in residence at Minnesota Street Project. 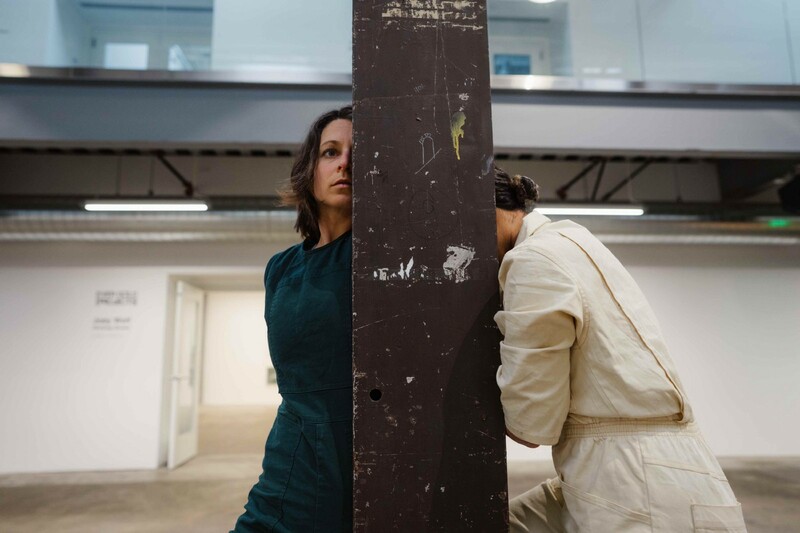 In anticipation of Dance Exhibit, which will be presented at Minnesota Street Project in May, Simpson and I talked about the project and how the venue is affecting her choreographic practice. Marie Tollon: In taking over the gallery space choreographically, what has been important for you to focus on? Lauren Simpson: I was thinking a lot about the white cube –its history, why the walls are white, why that matters. That got me thinking about contrast and how the meaning or the status of things (objects, people) gets elevated when put in a white box. I found it fascinating to think about how we got to the white cube — the political and artistic reasons as well as the architectural changes that were happening at the time. Then in dance we have the black box. The purpose of the black box is to show the body in the middle of the space, while the white cube is really about noticing what’s on the edges, walls, and surfaces. What’s fascinating to me about putting dance into Minnesota Street is that some of the physicality that I have been working with overtime actually becomes less important than the way bodies are related to the walls, surfaces, floors, pillars and the objects in the room. These objects are Dana Hemenway’s, Brion Nuda Rosch’s and the large pillars in the atrium. I’m recommitting to the objects and the materials of the space as opposed to thinking how this physicality I’ve been working on for the last several years looks like in the space because I realize it doesn’t matter. MT: In your work, there is a close attention to minute details and focused, small gestures. How is creating a work in this large space affecting your choreographic language then? LS: There’s something about the specificity and the details that I’ve been working on over the past few years that are present in the way that we’re working with objects. So it feels like a natural extension of Still Life №8 where we had the table in the space. There we were in a black box, at CounterPulse, and we could really guide the viewers’ eyes to what we wanted them to see. In this space you can’t. You are just so drawn to the architecture, the height and the depth of the space that it has become what it’s about. It’s been a challenge for me because my training as a dancer has been so body-focused but I realize I have to be much more design-focused and context aware in this space. And it almost requires a re-training of my eye. MT: In Still Life №7, you used video as an alternative way to guide the viewer’s gaze to details that would likely be lost in the theater. What tools are you using to direct the viewers’ focus in the gallery space? LS: There’s a walking pattern that the five dancers do. They stay as a school of fish and so it’s a little bit like watching a laser pointer around the space. If there were just one person doing that or several people going all over, it would be lost. Another element will be the lighting. Over the course of the evening it will get darker and there will be theatrical lights to tell you where to look. MT: Are the art works made by Dana Hemenway and Brion Nuda Rosch pre-existing or new pieces? LS: Dana is using an existing piece that she is re-formatting for this project. They are long extension cords made in macramé weaving that are going to lie on the floor. There’s a moment when we unplug a section of them and dance in unison with it, exploring its materiality with our own body. We do the same treatment with Brion’s rebar but while the cord is very flexible and pliable, the rebar is much stiffer. Another big revelation for me was that I had it to treat the space -like the pillars in the space- in the same way I was treating these objects — so we obviously can’t move a pillar that holds up the building around but we can try. We see how that makes the body react. MT: Through your collaboration with both visual artists, did you find a common language? LS: Both are curators. Usually, in visual arts shows, cords are hidden or put behind plastic guards. There’s a lot of choreography that happens with the hiding of all these things. Dana wanted to reveal them but also show the extravagant lengths at which people go to make it all happen. So she’s doing this intricate weaving of the cords. For the rebar, they are found pieces that also live inside of a building so you don’t see them. Similar to the cords, Brion reveals them and also treats them with these beautiful colors. So he is applying a level of craft over this functional material. And I would say I do a similar thing with movement: I take gestural movements that are pretty basic and then apply a level of craft. That’s a parallel we all have. MT: What interests you most in working with visual artists? LS: The visual arts are just adjacent enough to dance that visual artists offer a great perspective on what we’re doing. There also seems to be a general interest from the visual arts in performance and the body in relationship to objects. Sometimes I find visual artists’ feedback more helpful than dancers’ feedback about the work. For instance Dana was looking at the work one day, when the dancers were traveling in this formation, far away from where we were sitting. And she said: “Oh, the resolution of the dancers changes when they go this far.” And I had never thought about the word resolution before. When you think in terms and language you’re not used to -in this case, you think about depth of field and resolution- it changes the way you think about what you are doing. That really helped me.